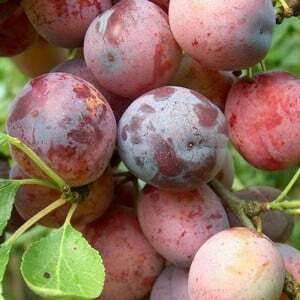 Organic Opal Plum trees produce a medium sized reddish purple dessert plum of really good flavour and is an early alternative to the Victoria Plum. A very reliable self fertile plum tree that produces a neat round head. Grown on the moderately vigorous St Julien A rootstock, our Organic Opal Plum Trees are supplied as maidens which makes training them as spectacular fan trees along a warm, south facing wall an easy job. Will also flourish in bush tree form too and produce heavy crops of the renowned reddish purple skinned fruits. Can be eaten straight from the tree when ripe from early August as well as perfect for making jams and preserves. See our Guide to Successful Fruit Trees for more growing advice.